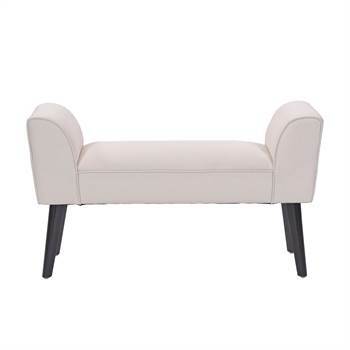 The beautiful bench NORA VITA with practical armrests has an optimal seat height and padding to have it really nice and comfortable on it. NORA VITA's black solid wood legs give the bench a stable hold. The cream-white cover also gives NOTA VITA an elegant look. Its appearance is held in black-and-white tones to fit perfectly into any classical style of furnishing. The fabric cover is made of polyester and is therefore easy-care. Measurements (app. ): Width: 35.5", Height: 21.5", Depth: 12", Seating height: 18", Seating width: 23.5"
Find more benches and seatings in different styles in our shop!